My earliest memories of jumpsuits are those worn by the showmen of the 1970s such as singing legend Elvis Presley and motorbiking daredevil Evel Knievel. Elvis wore a number of flamboyantly-designed jumpsuits, and I particularly remember the white one he wore at his Las Vegas concerts in 1973 with a matching cape and an over-sized belt. Around the same time, Evel Knievel wore a patriotic leather jumpsuit and a cape while he was at the height of his career. Indeed, I was such a fan of his that I persuaded my parents to buy me an Evel Knievel stunt cycle which quickly became one of my favourite toys of my childhood. Rock star Suzi Quatro used to send pulses racing in her tight leather jumpsuit and who can forget those futuristic designs that featured in numerous sci-fi movies an TV Series. 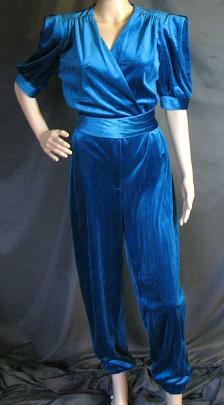 The jumpsuit was also popular in disco culture and ABBA wore a whole array of extravagant designs during their reign at the higher end of the pop charts. 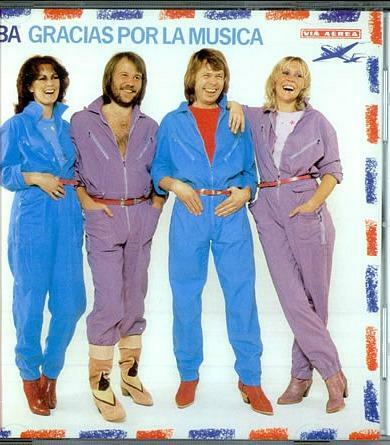 The sleeve of "Gracius Por La Musica" a Mexican album release from 1980 sees ABBA donning industrial style jumpsuits. 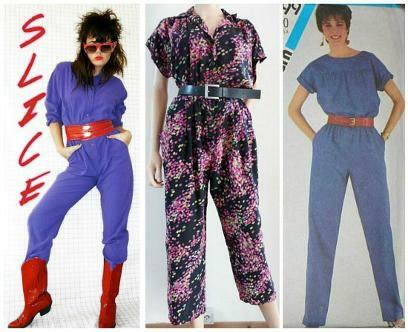 When we'd all grown tired of bell-bottoms and the disco sound, the 80s introduced us to a reinvented jumpsuit design with added batwing sleeves and more tapered legs. Unlike the 70s, it was mainly the ladies who wore them. Take a look at some of the old Top Of The Pops clips and you're sure to spot several female members of the audience wearing one with a big belt around their waists. Rompers are very similar in style but are cut short on the bottom instead of including full-length pants - these were more suitable for wearing in the warmer summer months. Jumpsuits were, of course, easy to slip into and pretty comfortable to wear. But they had one major flaw - when you desperately needed the toilet you had to remove it completely before going about your business! Here we have a very 80s purple jumpsuit with red belt and boots, a dot patterned, one-off French romper suit and an original jumpsuit from 1982.